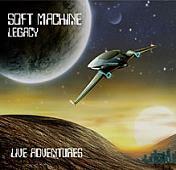 Review: "Soft Machine Legacy: Live Adventures" - Sea of Tranquility - The Web Destination for Progressive Music! Recorded at two successive nights on October of 2009 (one night in Austria, the other in Germany), Live Adventures once again sees a revamped Soft Machine Legacy after the passing of legendary bassist Hugh Hopper. Just as he did in the 1970's when Hopper left Soft Machine to pursue a solo career and other musical opportunities, veteran bassist Roy Babbington (ex-Nucleus & Keith Tippett Group) has once again stepped into the fold and taken over the bass role, and alongside guitarist John Etheridge, drummer John Marshall, and reed player Theo Travis, the band not only keep the spirit of the original Soft Machine alive, but take their music into this new decade quite nicely. And, it remains a fitting tribute not only to the recently deceased Hopper, but also to Elton Dean as well, who passed away a few years back. Though much of this live album contains new material from the current line-up, a few nods to the past are here, such as the moody Karl Jenkins composition "Song of Aeolus", complete with fiery liquid guitar lines from Etheridge, and a few of his others like the raucous jazz-fusion burner "Gesolreut" and his classic, smoldering cut "The Nodder". The band even launches into Hopper's "Facelift", and it's given a dark, almost doomy flavor thanks to some haunting sax from Travis, bubbling bass from Babbington, and Etheridge's stabbing guitar lines. The new tracks from the band are quite good as well, and perhaps a tad more atmospheric and experimental, like the chilling "Has Riff", the brooding "Last Day", and the two upbeat jazz-rockers by Etheridge, "Grapehound" and "In the Back Room". Nice to hear the guitarist really ripping it up here, showing that he's a player of formidable skills. Marshall's drum work also cannot be overlooked-just check out his delicate yet busy stick work on "Grapehound" while Etheridge is blazing away over the top on the guitar. Very impressive. Four very talented players, nine very engaging tunes, all make for a highly enjoyable album from Soft Machine Legacy.Throw in some excellent cover artwork by MoonJune Executive Producer Leonardo Pavkovic (I almost thought I was looking at a classic Yes/Saga album cover hybrid) and you have one highly recommended CD for jazz-fusion and prog fans alike.